Despite allusions to its prohibition in the Qur’an, tattooing has survived for centuries in the Islamic societies of North Africa. According to the opinion of Moroccan lawyers interviewed in the 1920s, tattoo was strictly “forbidden” and was accursed in the holy book, since the seat of the tattoo caused injury; the pigment, impregnated with blood, remained under the wounds thus rendering the body imperfect in the eyes of Allah. Furthermore, the tattoo was an obstacle preventing water from penetrating the skin during the ritual ablutions of purification: one of the five fundamental precepts of Islam. Generally speaking the Berber term for tattoo is oucham (“to mark”). 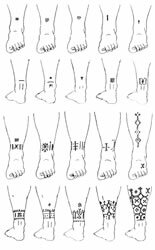 Tattoos were traditional or l-qayda (“custom”) and some motifs were rooted in the ancient Berber alphabet known as Tifinagh. The Tifinagh is a figurative alphabet derived from tools used in agriculture, sea products, and constellations. It is no longer written but continues to be spoken by some hill tribes today. Upon examining the list of extant letters, more than a dozen Berber tattoo motifs are common to the alphabet and these symbols generally appear on the chins of Berber women as siyâla. Women's tattoos of the Rif Berber of Morocco, ca. 1930. 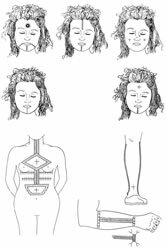 When the facial tattoos of Rif Berber women consisted of cross-patterns on the chin, the body was also tattooed extending down to the throat to the abdomen in one continuous design. But not all Berber tattoos were literal in this sense. In the early 20th century, the Rif Berber women of Morocco, among others, practiced tattooing as a prerequisite for marriage. When a girl was certain that she was to be married and when all arrangements for her wedding had been made, her family called in an old woman of the same awar, or sociological family, who was expert in the indelible art. If no such woman was available, one was called in from outside and if the tattooist was related to the client no fee was paid. Next, the old tattooist began preparing her liquid tattoo pigment of lampblack and juice squeezed from the leaves of broad (fava) beans. According to Berber scholar Pierre Bourdieu, broad beans (ajedjig) embodied multiple referents for the Kabyle of Algeria. First, dried broad beans were male symbols akin to human bones. Second, "being a desiccated seed which, after burial in the damp womb of nature, it swells and comes up again, more numerous, in spring," the broad bean also symbolized the refuge of the soul awaiting resurrection. Berber women's leg tattoo (ahdjdjdam eddarr) from Morocco, ca. 1920. One elder woman said that a woman without tattoo marks on the left heel would have no children. Berber women also tattooed themselves in order to ward off malign influences which might threaten their children. After the broad bean pigment was thoroughly mixed, the tattooist began breaking up the usual monotony of her preparatory routine with outbursts of conversation and advice for her tattoo client. Whether or not she came from within or outside the girl’s awar was not important, for the tattooist spread the local gossip, newsworthy events, and her own personal views on men and the institutions of marriage which she had gained throughout her lifetime working with other women. These intimate conversations gathered experiences, thoughts, and memories to generate a given view of the world, one which engendered commitment to existing institutional structures of marriage that soon would shape the new identity of the client. However, before the girl moved outside the familiar confines of her family’s awar to that of her husband’s, her position or place in the world at that moment seemed to be separated in time and space from normal everyday existence. Ultimately, this transition to a new life would be filled with discovery, but more importantly it would be marked by transformation; since after the tattooing the girl would become a woman, a sexual being who was accorded a new status that had the potential to bring her greater social recognition and fulfillment via the sanctity of motherhood. Berber women, as the center of the family’s sacred identity and guardians of the family’s honor and reputation, were situated within a sociomoral universe that affirmed their importance in everyday society. They were responsible for all magical practices intended to safeguard life (e.g., rites against the evil eye), and those designed to maintain the life of their children for which they were responsible - as well as the generative powers of which they are the bearers.